The Ben & Jim Show | 103.9 \"The Truck\"
Over the past 30 years, NO OTHER RADIO PROGRAM in the Fargo-Moorhead area has exceeded the audience size of The Ben & Jim Show! Unlike other Fargo-Moorhead radio shows, The Ben & Jim Show CONNECTS WITH LISTENERS through heavy use of LIVE INTERACTIVE PHONE CALLS and many ON-SITE LISTENER POWERED EVENTS! 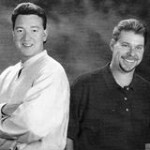 The Ben & Jim Show has had a SUCCESSFUL HISTORY, drawing LARGE AUDIENCES and MEDIA ATTENTION in markets including Tampa, Miami, Boston, and Evansville, Indiana. ‘Like’ Ben And Jim On Facebook..